You guys, I'm still addicted to raw treats. They're just so easy to eat on the go and so quick to make! 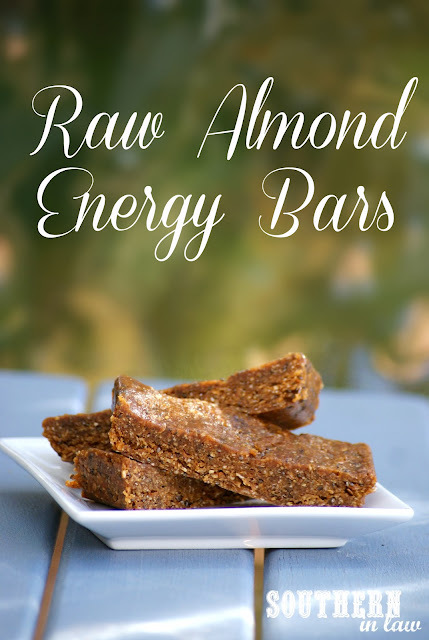 These no-bake almond bars (or raw almond bars) are so so good and it's safe to say they may be my current favourite (No offence to the Peanut Butter Cookie Dough Raw Balls or Gingerbread Raw Balls). I keep them in the freezer and grab one as I need them - you can let them sit for a while to soften or eat them straight away. As someone with a million and one allergies, there are always snacks in my purse - so whenever I'm having a busy day I make sure to grab a bar (or a ball - make them however you prefer!) before I head out the door! Get out a baking dish and line it with baking paper. In a food processor, pulse your dates until chopped (if they've been in the fridge, leave them out to soften or pop them in the microwave for 20 seconds). Add in your oats, chia seeds and flaxseed and mix until your oats are almost completely ground. Add in your almond butter, mixing until the mixture starts to clump into a ball. If needed, add in your water drop by drop until your mix forms a ball and everything is incorporated. Place your mixture into your lined tin and squish out using another piece of baking paper and your hand. If you mix is really sticky, try either squishing the mix with wet hands, the back of a wet spoon or slightly wet baking paper. Chill in the fridge or freezer until firm (freezer takes about 30 minutes, fridge takes a couple of hours). Once chilled you can either roll the chilled mixture into balls or slice into bars. But tell me, what is your favourite snack of the moment? At the moment I can't pass up these bars - or salt and vinegar rice cakes. Yummm.